You don’t need a degree in advanced probability to know that Prime Minister Benjamin Netanyahu is likely to get the nod to form a government, but while some papers see a simple 1+1 = Bibi equation Monday morning, others see a more complex problem set involving ethnic and ideological divisions, the multiplication of racism and the subtraction of any chance to form a unity government. 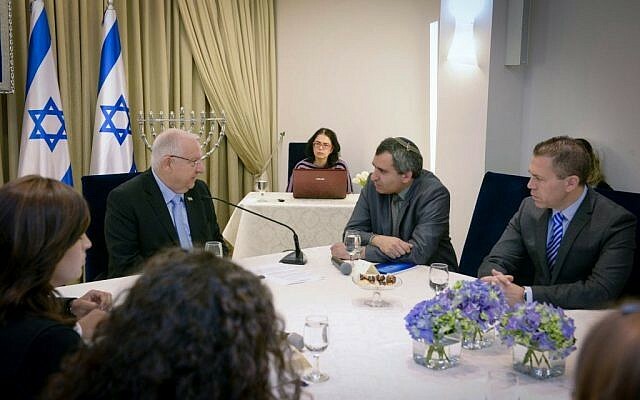 While parties are sitting down with President Reuven Rivlin to consult over who should form a government, the meetings have become a microcosm for the deep divisions splitting open in the wake of the left’s poor showing, of comments by Netanyahu widely seen as race-baiting, and the secular-religious rift, which is playing out in the battle of who will sit with whom in the coalition. The paper rounds up all the hateful and divisive comments that came to the fore during and after the election, rolling it into a mud patty of nauseating proportions. Much of the coverage focuses on the Sunday morning TV appearance of radical Prof. Amir Hetsroni, who trolled the country and was kicked out of a Channel 2 studio for saying that Jews of Mizrahi extraction are ruining the country and that his Ashkenazi heritage should afford him more rights. But while commentator Ben Dror Yemini calls the comments, and the electoral drive for Mizrahi Jews to only vote for Mizrahi Jews, a “festival of hate,” he notes sunnily that most of the country is not actually riven by such deep divides. “There’s no chasm between the camps. No chasm between Sephardim and Ashkenazim. Nonsense. There is an abyss between the extremes. Madness against madness. Hatred against hatred. In the bustling reality of Israel, it’s different. Over the weekend, two days ago, I was at a family event in a suburb of Tel Aviv, a celebration in honor of a newborn girl. The mother was ‘mixed.’ Not Ashkenazi and not Mizrahi. The father is an engineer, a kibbutz member. There were many more such pairs. The middle class. The elections were forgotten. It turns out that when you leave the bubble of the extremes, there is another life,” he writes. It’s a nice thought, but at least in the halls of power, national healing is not on everyone’s mind. Hence Haaretz’s main headline, which reports that while Rivlin called for a broad governing coalition, the ultra-Orthodox parties have put the kibosh on that option by refusing to sit alongside secularist Yesh Atid. “For the sake of the honor of the politicians, such an idea cannot be entertained,” United Torah Judaism MK Meir Porush is quoted telling Rivlin when faced with the possibility of bringing Yesh Atid in. The paper’s Yossi Verter writes that if Netanyahu does choose the path of a narrow right-wing government, he’ll find himself on a “fatal” collision course with Washington. Instead, he suggests a few ways that Netanyahu can bring rival Zionist Union into the fold, despite the fact that both sides have denied that is an option. Verter says Netanyahu will have to give Zionist Union head Isaac Herzog the Foreign Ministry, take a serious run at a peace deal with the Palestinians, such as he hasn’t done before, and find a good spot for Hatnua head Tzipi Livni. Plus he’ll have to give the Finance Ministry to Labor No. 2 Shelly Yachimovich, who he says is the linchpin to the whole deal. “Yachimovich is the key, she is a silver platter, a golden bridge, upon which the Zionist Union can slip into the coalition. Without her backing, the Labor central committee will give a solid nyet to [Herzog], and half the Labor faction will say they don’t see themselves as obligated to a coalition like this,” he writes. The paper downplays Rivlin’s calls for unity and against hate speech, instead focusing on the jostling between the parties over who will join the coalition and at what cost. The paper spills ink on all the inside baseball wheeling and dealing, like a fight within Jewish Home as to whether leader Naftali Bennett will push for the Defense Ministry, and therefore give up his party’s chances of holding a second smaller ministry, like education. But all that matters little to pen-jockey Dan Margalit, who writes that the coalition building is already a done deal even before negotiations have begun. He states unequivocally that Moshe Ya’alon will stay as defense minister, Kulanu’s Moshe Kahlon will be finance minister and UTJ head Yaakov Litzman will take the Health Ministry. The rest, he says, is commentary.